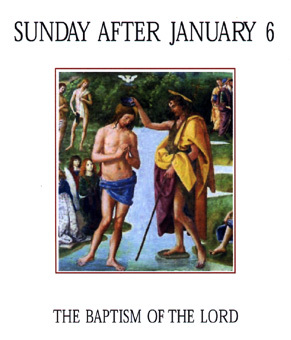 The Sunday in which we commemorate our Lord's Baptism provides an opportunity for the entire family to discuss this sacrament. Children baptized as infants, of course, cannot remember their own baptisms, but they will love to be shown photographs of their Christenings and told of how this special day was celebrated. You may want to get out the baptismal gown or baptismal candle to give the children a visual reminder of their initiation into the Christian faith. 1223 - All the Old Covenant prefigurations find their fulfillment in Christ Jesus. He begins his public life after having himself baptized by Saint John the Baptist in the Jordan. After His resurrection Christ gives this mission to His apostles: "Go therefore and make disciples of all nations, baptizing them in the name of the Father and of the Son and of the Holy Spirit, teaching them to observe all that I have commanded you." 1224 - Our Lord voluntarily submitted Himself to the baptism of Saint John, intended for sinners, in order to "fulfill all righteousness". Jesus' gesture is a manifestation of His self-emptying. The Spirit who had hovered over the waters of the first creation descended then on the Christ as a prelude of the new creation, and the Father revealed Jesus as His "beloved Son." 1225 - In His Passover Christ opened to all men the fountain of Baptism. He had already spoken of His Passion, which He was about to suffer in Jerusalem, as a "Baptism" with which He had to be baptized. The blood and water that flowed from the pierced side of the crucified Jesus are types of Baptism and the Eucharist, the sacraments of new life. From then on, it is possible "to be born of water and the Spirit" in order to enter the Kingdom of God. See where you are baptized, see where Baptism comes from, if not from the cross of Christ, from His death. There is the whole mystery: He died for you. In Him you are redeemed, in Him you are saved. For more from the Catechism go to the Links page. 119. Closely connected with the salvific events of the Epiphany are the mysteries of the Baptism of the Lord and the manifestation of His glory at the marriage feast of Cana. Christmastide closes with the Baptism of the Lord. Only in recent times has the feast been rehabilitated, and hence has not given rise to any particular displays of popular piety. However, the feast presents an excellent opportunity for the faithful to be reminded of their rebirth as children of God in Baptism. The rite of asperges could be opportunely used at all Masses on this day, and homilies could well concentrate on the symbols associated with Baptism. Behold My servant, whom I uphold, My chosen, in whom My soul delights; I have put My Spirit upon Him, He will bring forth justice to the nations. He will not cry or lift up His voice, or make it heard in the street; a bruised reed He will not break, and a dimly burning wick He will not quench; He will faithfully bring forth justice in the earth; and the coastlands wait for His law.... "I am the Lord, I have called You in righteousness, I have taken You by the hand and kept You; I have given You as a covenant to the people, a light to the nations, to open the eyes that are blind, to bring out the prisoners from the dungeon, from the prison those who sit in darkness. "Ho, every one who thirsts, come to the waters; and he who has no money, come, buy and eat! Come, buy wine and milk without money and without price. Why do you spend your money for that which is not bread, and your labor for that which does not satisfy? Hearken diligently to Me, and eat what is good, and delight yourselves in fatness. Incline your ear, and come to Me; hear, that your soul may live; and I will make with you an everlasting covenant, My steadfast, sure love for David. Behold, I made him a witness to the peoples, a leader and commander for the peoples. Behold, you shall call nations that you know not, and nations that knew you not shall run to you, because of the Lord your God, and of the Holy One of Israel, for He has glorified you. "Seek the Lord while He may be found, call upon Him while He is near; let the wicked forsake his way, and the unrighteous man his thoughts; let him return to the Lord, that He may have mercy on him, and to our God, for He will abundantly pardon. For my thoughts are not your thoughts, neither are your ways my ways, says the Lord. For as the heavens are higher than the earth, so are my ways higher than your ways and my thoughts than your thoughts. "For as the rain and the snow come down from heaven, and return not thither but water the earth, making it bring forth and sprout, giving seed to the sower and bread to the eater, so shall my word be that goes forth from My mouth; it shall not return to Me empty, but it shall accomplish that which I purpose, and prosper in the thing for which I sent it. A voice cries: "In the wilderness prepare the way of the Lord, make straight in the desert a highway for our God. Every valley shall be lifted up, and every mountain and hill be made low; the uneven ground shall become level, and the rough places a plain. And the glory of the Lord shall be revealed, and all flesh shall see it together, for the mouth of the Lord has spoken." Get you up to a high mountain, O Zion, herald of good tidings; lift up your voice with strength, O Jerusalem, herald of good tidings, lift it up, fear not; say to the cities of Judah, "Behold your God!" Behold, the Lord God comes with might, and His arm rules for Him; behold, His reward is with Him, and His recompense before Him. He will feed His flock like a shepherd, He will gather the lambs in His arms, He will carry them in His bosom, and gently lead those that are with young. And Peter opened his mouth and said: "Truly I perceive that God shows no partiality, but in every nation any one who fears Him and does what is right is acceptable to Him. You know the word which He sent to Israel, preaching good news of peace by Jesus Christ (He is Lord of all), the word which was proclaimed throughout all Judea, beginning from Galilee after the baptism which John preached: how God anointed Jesus of Nazareth with the Holy Spirit and with power; how He went about doing good and healing all that were oppressed by the devil, for God was with Him. Every one who believes that Jesus is the Christ is a child of God, and every one who loves the parent loves the child. By this we know that we love the children of God, when we love God and obey His commandments. For this is the love of God, that we keep His commandments. And His commandments are not burdensome. For whatever is born of God overcomes the world; and this is the victory that overcomes the world, our faith. Who is it that overcomes the world but He who believes that Jesus is the Son of God? This is He who came by water and blood, Jesus Christ, not with the water only but with the water and the blood. And the Spirit is the witness, because the Spirit is the truth. There are three witnesses, the Spirit, the water, and the blood; and these three agree. If we receive the testimony of men, the testimony of God is greater; for this is the testimony of God that He has borne witness to His Son. When the goodness and loving kindness of God our Savior appeared, He saved us, not because of deeds done by us in righteousness, but in virtue of His own mercy, by the washing of regeneration and renewal in the Holy Spirit, which He poured out upon us richly through Jesus Christ our Savior, so that we might be justified by His grace and become heirs in hope of eternal life. Jesus came from Galilee to the Jordan to John, to be baptized by him. John would have prevented Him, saying, "I need to be baptized by You, and do You come to me?" But Jesus answered him, "Let it be so now; for thus it is fitting for us to fulfil all righteousness." Then he consented. And when Jesus was baptized, He went up immediately from the water, and behold, the heavens were opened and He saw the Spirit of God descending like a dove, and alighting on Him; and lo, a voice from heaven, saying, "This is My beloved Son, with whom I am well pleased." John preached, saying, "After me comes He who is mightier than I, the thong of whose sandals I am not worthy to stoop down and untie. I have baptized you with water; but He will baptize you with the Holy Spirit."